Located near the legendary Vail ski resort, Breckenridge ski resort has a casual feel to it. It does not have the crowd and liveliness of the Vail, but the skiing and the beauty of the resort are unparalleled. The criss-cross trials against the backdrop of five peaks give the skiers breathtaking views. 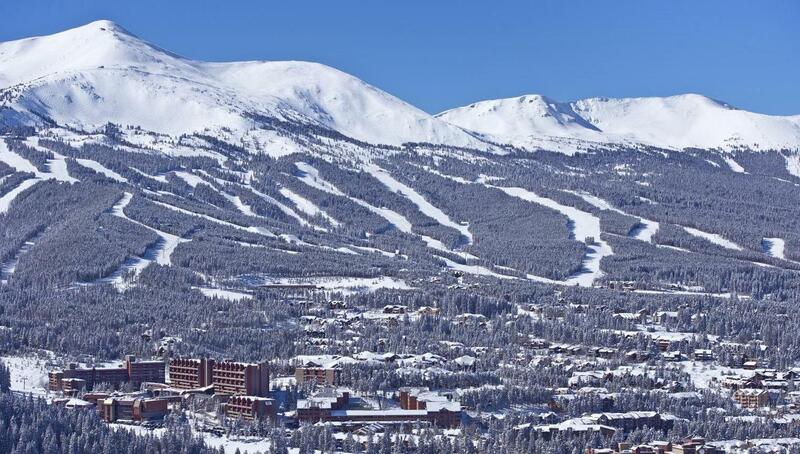 The Breckenridge resort is one of the most iconic ski resorts in Colorado. The ski season at Breckenridge begins in the middle of November and ends in the mid-April. The Breckenridge resort enjoys one of the highest summits in the US. The summit of the resort is at 12,998 feet. Different peaks in the skiing region provide distinct skiing experiences. The trails are designed to challenge all skiers according to their level of expertise in the sport. Breckenridge is an exceptional resort, the award-winning terrain parks, and the 22.' Superpipe. Breckenridge has two base locations that provide interconnecting lifts. The Breck Connect Town Gondola, Peak 8 and Peak 9 share the same base. Two high-speed quads connect the Peak 8 from the base access. The Colorado SuperChair and the RockyMountain Superchair are inter-connected with the quad chairs servicing Peak 8, taking skiers to higher terrain. The lifts for beginners are chairlift 5 and 7. These lifts start from the base location of Peak 8 too. At the base of the Beaver Run is the Beaver Super run chairlift that takes skiers to the intermediate terrain. From the central village location, the high speed super six quad chair The Quick Silver serves the terrain allocated to beginners. It provides access to the other lifts on the mountain including the Falcon lift-one of the most advanced lifts operating in the resort. The Breckenridge is home to the Imperial Express chairlift, the highest lift in North America. The lift provides access to 400 acres of expert and advanced terrain at 12,840 feet. The new Brecken Ridge gondola connects the Breckenridge town with the base location of Peak 8. It makes a stop at the base of Peak 7. The addition of the new gondola has given more access to the day skiers. Breckenridge, a former mining town is now a popular ski resort and with one of the highest summits in the US. The total skiable area of Breckenridge is 2,908 acres. The entire terrain is distributed among five interconnected mountains that include Peak 6 to Peak 10 consecutively. The resort is a powder paradise as it receives a massive 300 inches of perfectly fluffy powder each year. This makes skiing in Breckenridge an unforgettable experience for powder enthusiasts including snowboarders. The resort has more slopes and trails for advanced and expert skiers, but there are sufficient options for beginners and intermediate skiers. The Peak 6 was introduced in the skiing season of 2014 – 2015, an additional lift was added to the fully serviced intermediate terrain and further extend to the expert terrain. The ski area has four terrain parks and halfpipes; it includes the legendary half pipe at Peak 8. The management of the resort added three snowcats and a brand new pipe-grooming equipment. The artificial snowmaking comprises 380 snowmaking guns and covers 540 acres. Located at Peak 9 is the Bonanza, a trial designed for beginners, another trail for beginners is the Springmeier located on Peak 8. To get to Peak 8, skiers must take Chairlift 5; the lift provides further access to more green slopes. The highest capacity chairlift, called the QuickSilver Super6 has improved trail access for beginners. The lift connects beginners with plenty of green marked trails in the resort. Intermediate skiers must take the second mid-station of the BreckConnect gondola at the Peak 7 base location. The blue trails at Peak 7 are ideal for intermediate skiers who are willing to feel more confident with their skiing skills. Peak 7 is easily accessible the Independence Super Chair. The newly expanded terrain at Peak 7 is like a massive playground for intermediate skiers. Skiers can take the majestic blue trials across the Monte Cristo, Lincoln Meadows, Wirepatch, Pioneer, Angel’s rest and Claimjumper for a speedy cruise. The long and challenging Four O’Clock together with the bumpy trail of Lehman is ideal for intermediate skiers. The Peak 10 is one of the most challenging slopes for intermediate skiers. The trails like Doublejack, Centennial, Crystal, and Cimarron are marked blue and black. Skiers looking for expert terrain must use the T-Bar, Chair 6 and the Imperial Express takes skiers to have complete access to the advanced and expert terrain. A major black trail is accessible by taking the Falcon SuperChair Lift towards Peak 10. For steep runs between the woods, skiers must take the trails at The Burn, Corsair, and Spitfire. These trails are challenging, some are moderately steep running through the trees, and other are tight and wide with deep chutes. Right off, the Peak 10 skiers will reach the Mustang, Blackhawk; these trials have double black diamond steep slopes. The trials have a combination of steep pitches and flat runouts. The expert skiers often overlook chair E, but it provides some of the most challenging black double diamond trails like the Devil's Crotch, Mineshaft, Hades, and Inferno. These trials will challenge the most expert of skiers, with the ability to take expert skiing to another level. The expert terrain at the mid-station of Peak 8 SuperConnect rises around 1000 feet in just under 3 minutes. The Southern Cross and Mach 1 are excellent pitches that turn bumpy very quickly. Chair 6 takes expert and advanced skiers to the Horseshoe Bowl. Skiing their way up the T-Bar is challenging at exquisite at the same time. Expert skiers will love this trail for its powder. Skiers will enjoy skiing and test their skills on the Horseshoe Bowl, Cucumber Bowl, and Contest Bowl. All the three trails have extensive powder throughout the season giving skiers soft turns. For best powder skiers can ski their way towards Peak 8 for the steep powder-filled black marked trails. For expert skiers willing to test the ability of their skills must ski to the backcountry off-piste by using the designated gates. Skiers are advised to proceed with caution as the backcountry skiing is not patrolled or maintained by the resort. Expert skiers will love the challenging unmarked obstacles and another dangerous terrain. It is advised that even the most expert skiers proceed with caution in the backcountry, as there is a constant risk of avalanche and ski guides are unwilling to venture into the off-piste. The Breckenridge ski resort is paradise for skiers; the resort has sufficient powder entire season to curb skiing needs of the most expert skiers. Keeping the adventure of skiing, skiers love spectacular après. The après is essential most for skiers who have spent the entire day navigating the challenging pistes and off-piste skiing for the more daring. Towards the end of the day, all any skier want is to have a perfect spot to unwind. Breckenridge has several favourite places that skiers and locals love. The T-Bar a local and skier favourite spot to hang out for a memorable après. The T-Bar is located at the base of Peak 8 by the slope side. The restaurant and bar seats about 150 people which mean you have to come early to enjoy this happening location. Enjoy the evening with new and old friends and fellow skiers at the T-Bar. The ambience of this bar/restaurant is unappalled. The BreckConnect takes skiers directly to the T-Bar, the best part is that skiers and tourists can get a free ride downtown. The Copper Top Bar and Café is another popular après spot where skiers and tourists love to spend their evenings. The bar is famous for its foot thumping loud music that keeps the crowd pumped up and on their feet. A large variety of drinks, with live music and the company of friends, makes the Copper Top Bar a favourite spot for quality après. This exclusive après location is open for business only during the ski season. The bar timings are 10:00 am to 6:00 pm. The Maggie bar and restaurant is conveniently located at the base of Peak 9. Skiers head straight to The Maggie after they are done skiing for the day. They unwind at the bar to prepare themselves for another adventure filled and adrenaline-pumping day at the slopes. The bar is open daily from 10: am to 6:00 pm. Happy hour for Après ski is 4:00 pm to 6:00 pm. The Burke and Riley Pub is located right at the top of the La Cima Mall. The pub has a more English feel to it, as it offers English and Irish beers, special cocktails and martinis. The Burke and Riley’s Pub stays open at late night with some of the best views. The bar is open daily from 11 am to 2 am. Cecilia’s is a major attraction for late night après and partying. The nightclub and bar are ranked among the top ten après ski locations in Colorado. The Cecilia is home to the biggest dance floor and the most spectacular pole dancing destination in Breckenridge. The parties here continue until the early morning hours. Loud music, great martinis and one of the most iconic après location, a visit to Cecilia’s bar and nightclub should not be missed. This popular pub is for those who want strong beverages and relaxing ambience for their après. The pub offers local delicacies like the Avalanche amber ale, vanilla porter, and seasonal micro-brews. The bar timings are 11:00 am to 10:00 pm. The Golden Pan Saloon is an ideal après ski location for seasonal skiers. This location delivers the best balance of white-collar bar together with the very nostalgic Wild West from the 18th Century Gold rush era. Breckenridge is one of the finest ski resort in the State of Colorado; it is undoubtedly the best destination for skiing thanks to the remarkable 300 plus inches of powder it gets each year. Breckenridge is a skiing haven, but it has a lot to offer for non-skiers and skiers who just want to explore the town and see what it has to offer other than skiing. Before being an extravagant ski resort, the Breckenridge was a popular town in the Gold Rush era of the 18th century. The history walk tour is the best option to explore the town and hear thrilling stories about the gold rush. The tour is 90 minutes long; it’s the perfect way to explore the historical location of the town. This fun-filled festival is held in January to celebrate the snow, culture, and traditions of the towns. Enjoy the colourful parades and floats on the Main Street. 2018 will mark 55 years of this beautiful festival. At the end of the festival, people gather together to retire their Christmas trees in the large bonfire. Head to some snowshoeing at the Nordic Center in Breckenridge for snowshoeing with your family or partner. The Nordic Center has different tracks and trails ideal for snowshoeing for all ability levels. Guided tours are available for a better experience. Reservation for the tour begins at 11:00 am. For tickets and equipment charges, please visit the official website of Nordic Center. The last week of January is an important date for the locals and skiers at Breckenridge. The Snow Sculpture Championship is a major annual event in Breckenridge. This is your chance to witness the very rare art of snow sculpture since this is the World Championship expect the artists to take your breath away at this annual event. Be ready to be amazed and astonished at the Snow Sculpture Championship. Make your Dog sledding dreams come to life at Breckenridge resort. The dog sledging activity is ideal for those with family or a partner for a memorable romantic tour. Imagine coursing through the beautiful majestic forests of Breckenridge pulled by adorable Siberian Huskies. This is the perfect way to explore the backcountry in the tranquil forest. No trip to Breckenridge will be complete without some old-fashioned ice skating. Have some fun with your children and enjoy a fun-filled evening with your partner on the ice rink at the Stephen C. West Ice Arena. Apart from ice staking, try your luck at playing a game of ice hockey. Ride the spectacular and energy filled Gold Runner Alpine Coaster taking you on an exhilarating ride down 2500 feet. The Alpine Coaster lets you control the speed through the many turns, twists, and dips, around the ski run through the forest. There is nothing better than taking a breathtaking very nostalgic sleigh ride across the breathtaking backcountry of Breckenridge. The ideal activity for families, make some unforgettable memories on the majestic sleigh rides.